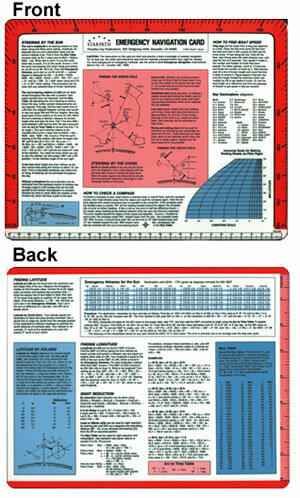 A handy card to have on board in case your sight reduction system, sextant, or almanac becomes lost. The card is loose-leaf sized. You can punch holes in it if desired for insertion in a binder. It is plastic laminated for weatherproofing and durability. A wealth of information is provided on it in addition to: an emergency almanac for the sun, and declination tables for the stars; several methods for accomplishing sight reduction, including one that requires only the card itself; and angular markings on the perimeter of the card that allows approximate altitude measurements of celestial bodies. Other information includes how to steer by the stars and finding your boat's speed. Could prove invaluable in a lifeboat situation.